A developing talent at Derby County, Birmingham-born Adam Murray had already played in the Premier League when he arrived on an initial month’s loan at Mansfield Town in February 2002. Murray made his debut for boss Stuart Watkiss in a 2-1 home win over Halifax Town. A few days later he scored both goals and won man of the match in a 2-1 home win over Scunthorpe. 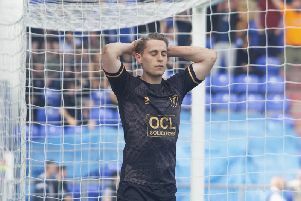 Murray had quickly won fans’ hearts with his all-action midfield displays and netted seven goals in his 13 games as he helped shoot the Stags to promotion to Division Two in the final game of the season against Carlisle. His rising career stalled after a tough spell battling alcohol addiction, but Murray was back at Mansfield in June 2004, re-joining the club from Kidderminster Harriers. He played 32 times, scoring five goals, in a poor season for the Stags that ended under the management of Carlton Palmer, Murray then moving on to Carlisle United in March 2005. After just seven games for Luton Town at the start of 2010/11, Murray was back at Field Mill for a third time under David Holdsworth on a three-month loan deal on 1st October 2010, the move made permanent on 5th January 2011. Under Duncan Russell, he helped Stags reach a losing Wembley final against Darlington in the FA Trophy in May 2011, playing on when injuries should have seen him sidelined and eventually laying on the turf in agony, almost unable to move having given everything for the cause. In came new boss Paul Cox soon after and by June 2012 Murray had been promoted to his assistant manager after Micky Moore’s decision to leave the club. That did not go smoothly as a mid-season spat with Cox in 2013 saw him farmed out on loan to local non-League sides Rainworth MW and Worksop Town before the pair patched things up and Murray skippered the side to the Conference title in a story with a very happy ending. When Cox left on 21st November 2014, Murray then took charge of the home game with Plymouth a day later, winning 1-0 on a thrilling, emotion-charged afternoon. He then steered the club past a tricky FA Cup replay away at Concord Rangers and, despite a 3-0 loss at Luton, accepted the job full-time on 5th December 2014, becoming the youngest manager in the Premier League or the Football League and also initially being a player-manager, a dual role he soon realised was too hard to continue. He had scored another 13 goals and played a further 142 times for the club by the time he hung up his boots for good. When he took over as manager, there was a very real possibility Stags were heading back towards the Conference. But he steadied the ship and managed to keep a very average squad in the Football League before a summer cull saw a big turnover of players. In 2015/16, Murray saw his new-look side shine too soon and be among the early frontrunners. That raised expectations well past the reality of the standard of opposition and other club’s budgets and slowly they fell away, a ‘March of doom’ seeing them winless and finally ending hopes of the play-offs. Optimism was high for the 2016/17 season, despite a bigger than wanted turnover of players due to better offers elsewhere. However, despite ‘promotion away form’, some poor home displays and just one win in 11 League games finally saw a parting of the ways on Monday.